I like GAVI (the Global Alliance for Vaccines and Immunization) a lot. 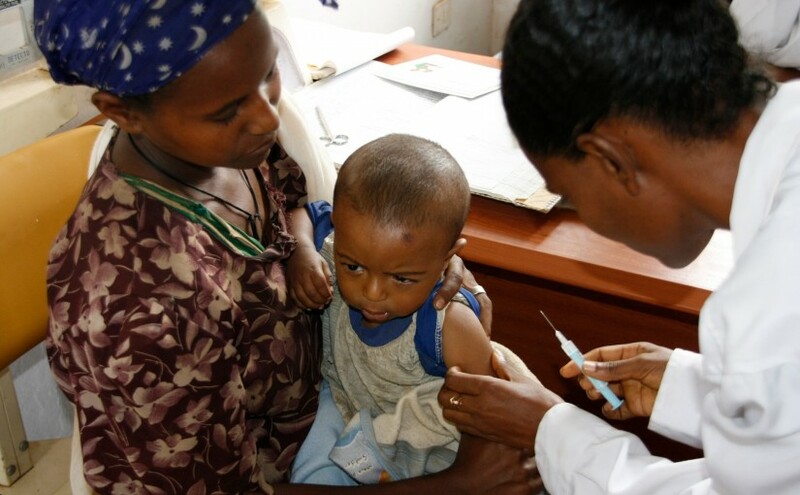 Childhood immunization is a hugely cost-effective way to help people in developing countries, and GAVI does very good work helping to get vaccines to children in developing countries. GAVI’s business model is based on the expectation that rising demand for immunisation in developing countries induces more companies to produce vaccines, thus creating competition and driving prices down. Let’s go back to the supply and demand curves of undergraduate economics (see diagram). If you move the demand curve out (“rising demand for immunisation”) then quantities and prices will both increase. The very best you could hope for is that supply of vaccines is very elastic (it isn’t, sadly); in that case the supply curve (the blue line) would be quite flat and the rise in price would not very large when demand increases. But supply curves are not flat (at least, not in the short run) and they certainly do not slope downwards, so prices ain’t gonna fall when demand goes up. I defy GAVI to produce an analytical model that underpins their “business model” as they describe it above. So what should GAVI’s business model be? There are two ways that GAVI can bring down the price of vaccines: one bad, one good. GAVI can work with UNICEF to drive down the price of vaccines by using the market power of a monopoly buyer (a “monopsonist”). When vaccine manufacturers make a sale, there is something in it for the seller (profit) and something in it for the buyer (the vaccine is worth more to them than they pay for it). The division of these benefits (the “surplus”) depends on the bargaining power of the parties. If GAVI and UNICEF can use monopsony powers, they can extract more of the surplus, by driving down the price and hence the profits of the vaccine manufacturer. In the world of development advocacy, pharmaceutical companies are pantomime villains, making outrageous profits at the expense of the poor. So reducing their profits and holding down prices must be good, right? Well yes, if you don’t want pharmaceutical companies to invest in research and development for future medicines for developing countries, if you don’t want them to invest in manufacturing facilities big enough to produce in large volumes for these markets, and you don’t want them to spend time and money getting their products regulatory approval in those countries, then driving down their profits is exactly what we should be trying to do. Of course, Big Pharma can look after itself, and that is what it does. When we take away their profits in developing countries then they will go and make profits somewhere else. Dastardly villains. Driving down the commercial viability of medicines in developing countries may not be our best plan. It may feel good in the short term sticking it to Big Pharma, but that is not necessarily good public policy. The anti-pharma campaigners should be glad they won’t be the ones who have to explain to a woman comforting her child dying of malaria why there is no vaccine for this disease. This isn’t a theoretical risk: it is what has actually happened to the vaccine industry over the last 40 years. Although this is not a great strategy, is is the approach being pursued by some global foundations such as the Clinton Foundation. The UNICEF procurement division has similarly long had the objective of driving down prices, without regard to the long-run viability of the businesses developing and supplying pharmaceuticals to the developing world. But GAVI can do something which benefits both developing countries and the pharmaceutical industry, increasing quantities and reducing prices. It can help to reduce the cost and the risk of producing vaccines for developing countries. By pushing down these costs, the result can be higher volumes and lower prices, in a way that does not simply transfer the surplus from producers to consumers. One way that GAVI can (genuinely) reduce costs without damaging the industry is by entering into long term contracts for vaccine purchases. Both the International Finance Facility for Immunization and the Advance Market Commitment are excellent examples of this approach [UPDATE: in the light of David Roodman’s comment below, let me clarify that GAVI is already doing this, which is excellent. My view is that they should do more of it.] Long-term commitments enable manufacturers significantly to increase production volumes and reduce unit costs (because the large fixed costs are spread over more units). It is the ability to make commitments, not the increase in demand, that is important here. Long term commitments are important because without them, vaccine manufacturers are vulnerable to “hold up“, a problem familiar in the economics literature on industrial organisation and utility regulation. Manufacturers face the risk that, once they have invested in developing a new vaccine, getting regulatory approval, and spending hundreds of millions of dollars putting in place large-scale manufacturing capacity, the donors will then gang together to use monopsony purchasing power to drive down the price to around the marginal cost, ignoring the sunk costs of developing and producing the vaccine. At marginal cost pricing, the manufacturer never recovers the cost of their investments. After the vaccine has been manufactured, this is a rational thing for donors to do, since it reduces the price to a level at which the largest number of vaccines can be purchased. But before the vaccine is manufactured, the vaccine companies anticipate the likely future behaviour of donors, given the donors’ incentives; and this undermines the investment case for developing and producing vaccines for the developing world. Donors can avoid this by entering into a long-term commitment which prevents them from driving down the price later on. GAVI can also use its expertise and connections with government to streamline and simplify regulatory processes, which are a big cost driver. Costs will fall, and demand will rise, as a result of this approach. But this is the opposite way round from GAVI’s current (economically illiterate) business model: under this approach the rise in demand is a consequence of the fall in prices, not the cause of it. So GAVI can have most impact by doing the opposite of what many people think it should do (and the opposite of what some other global funds try to do). Rather than using its market position to drive down prices, damaging the long-run viability of the vaccine industry, it should use its position to enter into long-term contracts which enable manufacturers to produce at high volumes and low unit costs. This means that rather than trying to drive down prices by increasing competition, GAVI’s business model should be to lower prices and so increase the amount of vaccines bought and used, while promoting the long-run health of the vaccine industry, by helping to reduce costs and risks for producers. You’re much more qualified than I am to speak on economics, but I think maybe GAVI’s statement makes sense. You’re right that based on a basic supply-demand graph, increased demand causes an increase in price and quantity – but I think the point that GAVI is making is that the supply curve will ALSO shift out as more companies get involved in manufacturing vaccines (assuming we’re talking about drugs without patents). Obviously this is not so for a new vaccine and takes some time for companies to begin producing even generics, but if supply shifts out, you get increased demand plus potentially a drop in prices as companies compete and become more productive. That being said, you’re absolutely right that a monopsony strategy of consolidating buying power to drive down prices is harassing the goose that lays the golden egg (if not killing it outright). GAVI obviously has a stake in that goose if they want more new vaccines and they are involved in advance market commitments – but looking at their 2007-10 Roadmap and Goals, the emphasis clearly seems to be delivering vaccines that are already developed. There’s no goal on getting a new vaccine – just goals on getting more existing vaccines out to children who need them. Your argument that GAVI needs to be thinking about the longer term is important, but if the critical need is to get basic coverage out as soon as possible, a monopsony strategy may make sense. And I would probably argue money spent on delivery of existing is better than money spent on developing new technologies that won’t be accessible for years and years. My broader question would also be to what extent GAVI’s actions IS changing the investment decisions of pharmaceuticals. This is beyond my pay grade, but I would buy that there’s room to both squeeze pharmaceutical profits in the short-term while also creating longer-term incentives that make it still be attractive and profitable to develop new vaccines. Yi-An – With respect, that’s an ingenious attempt to defend them, but it doesn’t work. Increasing demand doesn’t shift the supply curve, it shifts the demand curve (and so moves the equilibrium along the supply curve). To shift the supply curve you’d have to change something about the willingness of suppliers to produce and sell at each given price – for example, by changing the cost structure or risks. That’s why I recommend GAVI focuses on reducing costs and risks to suppliers: that would shift the supply curve. Owen, great post. My only quibble is (and I think the comment above is on similar lines), there might be an implicit assumption that the increase in quantity supplied leads to some form of innovation. This would then indeed cause a shift in the supply curve. I grant that this should be made clear, but I would assume that’s what they’re driving at. Anthony – If they think the supply curve will shift, then their story is back in business. But how is GAVI going to shift the supply curve by increasing demand? If there are supply side changes available that would bring down prices, what stops firms from shifting the supply curve anyway? If GAVI has an analytical framework that explains all this then I look forward to hearing about it. I regret to say that the simpler explanation is more likely: they have simply got this wrong. If they want to shift the supply curve, they need to do something that affects the supply side. Interesting post Owen. This reminds me of our AMC-design discussions. Since it’s been a little over a year since I moved on from GAVI, my former colleagues are no doubt better placed than me to address your point on the business model statement. A couple of points I wanted to mention though. The large funding base of GAVI, and its signalling to industry that it will support the introduction of newer and costlier vaccines means that many emerging manufacturers see a business opportunity and seek to enter the market. In general, since their cost structures are lower, this ends up resulting in a long-term price decrease. As you point out, this is not really a consequence of greater demand, but rather greater assurance that a viable market (for which vaccines will be purchased) exists. As for the point about demand rising as a consequence of falling prices, this is partly true. In reality, for many of the newer vaccines, the full cost of those vaccines is well above the level of what many countries can afford, so whether a pneumo vaccine for example is $2.75 instead of $6.50, it’s still beyond the reach of many countries without support from GAVI. The rise in demand is also the consequence of the provision of information and evidence on burden of disease, effectiveness of the vaccine, GAVI’s financial support, etc. Long-term contracting is certainly part of the solution as you point out. I think the challenge is to make sure that it does not lock the buyer into purchasing from a single supplier. The AMC is designed in such a way as to avoid this. The single supplier issue can be problematic because (a) there is always the risk of production problems interrupting supply; and (b) the “good” price obtained from that manufacturer can sunset leaving the buyer empty-handed if the deal has left the market without a diversity of suppliers. Lastly – on the UNICEF point, your comment regarding their fixation on low price is actually out of date. In 2000-01, they went through a strategic change in adopting a policy of vaccine security. This policy explicitly considers the overall health of the industry segment AND price. It means in practice that they will always buy from multiple manufacturers although this raises the weighted average price of the product. Some have criticized this approach, suggesting they buy a greater proportion from the lowest price supplier. However, the experience of measles is a case in point, where suppliers exited the market (as you note in your post) and the supplier base dwindled, leading to a fragile market. Their approach has in fact been an important instance where they have balanced the objectives between the public sector and industry to find a solution space that works for both. Andrew – thanks for these insights from someone who has had much more experience of these issues than me. I am happy to be corrected on UNICEF’s change of approach. But UNICEF’s approach of promoting competition among vaccine suppliers may not be sensible either. It is not completely obvious that it is economically desirable to have multiple suppliers of vaccines: there are large fixed costs and low variable costs, so very large returns to scale. This means that having two suppliers providing (say) half the market each would be likely to result in much higher unit costs than a single monopoly supplier producing for the whole market. In these circumstances it might be better to accept the scale benefits of monopoly supply, and to try to ensure that markets are contestible rather than ensure competition. The savings to purchasers from long term ex ante purchase commitments with a monopoly supplier, in a contestable market, would be larger by far than any savings from driving down spot prices by increasing competition. There is an additional benefit from having multiple suppliers because it may help to increase security of supply (if the supply risks are supplier-specific rather than disease-specific). The question is whether the (probably substantial) extra cost to purchasers of sustaining competition and multiple suppliers is worth paying to improve the security of supply. I’d like to see the cost benefit appraisal before offering an opinion, but my guess is that this would be a hard case to stack up. @Owen – Agreed, my mistake! It would be interesting to see GAVI articulate more of a goal on the supply side, but I wonder what the appropriate emphasis is on getting existing vaccines out vs. stimulating production of new ones. Long-term market commitments are great, but if you can leverage greater buying power, that is how the market works – and pharma certainly isn’t above trying to extend its patents even if it might mean less access for people who need it. Yi-An – I agree that pharma will respond to the incentives we create for it. Indeed, they are legally obliged to pursue the long-term interests of their shareholders, so it would be rather surprising if they did not pursue patent extensions at the expense of access for the poor. Those are the incentives we create by driving down the price. If we don’t like how they behave, we should change the incentives, not throw up our hands in horror. I’ve not thought about this deeply so I may have this wrong, but consider the following scenario. We start out with a monopoly (not sure whether this is relevant for vaccines). Higher demand increases monopoly profits, which, in turn, increases the attraction for other suppliers to enter the market. Hence, competition increases and we move towards a more competitive market in which the price ends up being lower than the price we started with. Nicolas – that won’t work. If we can see the end result coming, so can the other suppliers who are considering entering the market. We agree on the main point, which is that GAVI do not have in mind an explanation like the one you give. This is an industry, as you rightly imply, in which the economics of innovation must be central to the analysis. Whether you take a neo-classical approach or an Austrian-school approach, the critical question is whether there is sufficient incentive for innovation (and incentive to invest in production facilities with large fixed costs and modest variable costs). I hope my bog post makes it clear that I share (what I take to be) your view that it should be a policy goal to ensure that there is enough incentive for new companies to develop, improve upon and mass-produce products of value to the developing world (up to some limit – which we are nowhere near reaching – at which such incentive would be wasteful). We also agree that IF the supply curve shifts outwards, then we are in business. But the GAVI view – as expressed in their “business model” – is not merely silent on the creation of incentives for innovation, it actually implies a movement in the opposite direction. They say they want more firms “thus creating competition and driving prices down.” If prices are driven down as a result of competition this will necessarily reduce, not increase, producer surplus and so reduce, not increase, innovation. If the supply curve is going anywhere as a result of that, it is inwards, not outwards. So I actually don’t think you can construct an interpretation of their stated business model which makes sense, even for a devout follower of the Austrian school like yourself. Their colours are nailed to the mast by the phrase “thus creating competition and driving prices down”. I don’t think you can sensibly interpret this as meaning that they want to increase producer surplus and thereby stimulate innovation. Of course I think it should be their goal to stimulate innovation and create incentives for market entry; and I don’t think increases in demand, on their own, would be a cost effective way to do that. That is why I suggest other steps, especially increasing predictability of demand and reducing the risk of hold up, which I think would be effective. If it were really their intention to create the incentives you describe, they would not go about it they way they say they are. One way that GAVI can (genuinely) reduce costs without damaging the industry is by entering into long term contracts for vaccine purchases. Both the International Finance Facility for Immunization and the Advance Market Commitment are examples of this approach. I read this to imply that GAVI is not doing these things—but maybe that is just because you are being pedagogic? In fact, it’s already doing exactly that, right? David: absolutely right. Sorry that wasn’t clear. You say: They say they want more firms “thus creating competition and driving prices down.” If prices are driven down as a result of competition this will necessarily reduce, not increase, producer surplus and so reduce, not increase, innovation. Ultimately, yes. But I understand the causality to be profits for vaccinations -> innovation -> lower prices. You are talking about the effects of lower prices, I am talking about the process that brings those lower prices about. But I think that you’re now shifting your argument. Your original problem was that lower prices wouldn’t result from increased demand. Now you’re saying that once prices start to fall the incentives for further innovation will also fall. Correct, but there’s a plausible defense for the model they outline. Anthony – once again, we’ll have to agree to disagree. My point has consistently been that increasing demand will not result in lower prices, and for any mainstream economist there really isn’t a huge amount to argue about here. If you want to believe that (a) that increasing demand will reduce prices and/or (b) that GAVI has become an adherent of the Austrian school of economic theory, then all I can do is wish you the best of luck. Owen, Thank you for an interesting post. Entering into long term commitments with the pharmaceutical industry seems like a good idea, my only comment would be that it might contribute to raise barriers to market entries for new companies wanting to compete on the market – and thus also in the long run keep prices artificially high. I think the pharmaceutical industry needs to be under constant pressure to reduce prices, find and develop new and more efficient ways of producing pharmaceuticals, including vaccines, for the benefit of the consumer. I also like GAVI, I have been involved in the GAVI HSS Tracking Study for the past year, and it has been interesting to see how GAVI works on the ground and how its support translates into service provision. GAVI works quite well, it has distinct and very clear objectives and it seems to be able to reach out. I would concur with the submission presented by Andrew, Anthony and Par. Those of us that have had the opportunity to work on the GAVI/UNICEF procurement and supply arrangement do believe that this initiative has been had significant and positive impact on child immunisation, specifically in developing coutries. The initiative of retaining vaccine manufacturers in this sector of health has been largely the core of GAVI, through assuring availability of funds. Long- term contracting has also enabled those manufacturers to invest in bulk production against assured orders, and thus keep the prices down. Indeed, the UNICEF approach of assuring that the research / innovation that are required in pharmaceutical business is maintained, is one of the most responsible positions as it aims to support public health in the long run; this is in line with your comments in this respect. Thus, the three pillars of vaccine security (good forecasts of global need, firm and assured funding, and then good procurement arrangements) are meant to provide a reason for keeping the unit price down. However, as Andrew points out, even at about USD 2.75, few, if any, developing country can afford to unilaterally finance their needs for vaccines. So, the reality on the ground seems to be that the GAVI initiative (forget the business model, which, in the way being articulated above, does not appear to be in line wiht the facts on the ground) has gone to great lengths to protect children. So far as I can see, a number of manufacturers of child vaccines meant for developing countries recognise why they are in this business. Is there a need to further reduce unit prices? I would say, yes there is, and if there were additional ‘GAVI’ arrangements, I am sure the costs would come down further. Bonnie I agree with you that GAVI does good work and I began the blog post by saying that it is an organisation which I admire. Like you, I largely agree with Andrew and Par (and they seem largely to agree with me). I doubt if you do in fact agree with Anthony – his views are quite a long way from the argument you make. I would be interested to see the analysis on which you have based your conclusion that there is a need to reduce “unit prices”; and, in particular, your analysis of the trade off between access to medicines today and the incentives for the vaccine industry to produce for developing countries in the future. These issues are rather too important to leave to instinct, so I hope you have reached this conclusion on the basis of a proper analysis of the lives at stake now and in the future. I also don’t think you can lightly dismiss the fact that the stated “business model” makes no sense. GAVI could do an even better job if it had a sharp and coherent business model and pursued it consistently across the organisation. I can’t resist joining this great discussion. Thanks for a characteristically provocative and lucid post, and thanks to Andrew and the others for many great points. I will add four. First, it seems to me that your argument (and the following discussion) overlooks a bit the very important distinction between vaccines with large rich-world markets (pneumo, HPV, rota) and those will little or none (malaria, cholera). For the first class, one could argue that UNICEF/GAVI can drive a fairly hard bargain without putting at risk incentives for innovation. Of course the price still has to cover the cost of building capacity, but not much or any of R&D costs. This is of course why tiered pricing can work. For vaccines of the second class the situation is of course very different, and prices have to cover R&D costs (unless these are covered in some other way). The objection to this simple dichotomy is obvious: firms may take UNICEF/GAVI behavior regarding prices of existing “global” vaccines as an indicator of how they will behave once a “neglected disease” vaccine is developed. For this reason, mechanisms (like AMCs) that provide some assurance of a respectable price in advance may be necessary for vaccines of this type, although I note that to the extent that the big firms are working on neglected disease vaccines now, they probably aren’t doing so primarily for commercial reasons, with the possible exception of Sanofi and dengue. Second, to follow up on Andrew’s point, the best way to bring prices down (or to accelerate the decline that almost always occurs eventually) is to increase the capacity of emerging market firms to develop follow-on versions of new vaccines and reduce regulatory and other barriers to their entry. In the longer run, this would also help these firms to become truly innovative. It’s difficult for me to believe that having more than five firms capable of bringing entirely new vaccines to market wouldn’t be a good thing. Of course, once developing country firms develop their own new vaccines, they will also have large R&D costs to cover and their business models will evolve. So your basic points will remain in force – the laws of economics will not have been repealed. Third, we shouldn’t forget that paying more than marginal cost for vaccines is at best a necessary evil, a “second-best” solution, and we should leave the door open to more creative ways to cover R&D costs while permitting purchase at close to marginal cost. The original AMC idea, with its short-term price subsidy and long-term low price commitment, is one way to do this, but various types of prize schemes might be another. Finally, another very important factor in determining vaccine cost is often overlooked: vaccine design. If cost is a consideration from the start, it will often be possible to develop vaccines that can be produced at much lower cost while meeting local needs. One of the problems with relying on vaccines developed by the big firms for high-income market is that developing vaccines that can be produced cheaply isn’t an important part of their business model. In some cases it may even be cheaper to pay for the development of a new, cheap vaccine rather than purchase an existing one: this is the rationale behind PATH’s meningitis vaccine project. Excellent post. One quibble though: you rightly identify that there is a battle to divvy up the surplus at a given equilibrium. A Monopsonist in the present of perfect supply-side competition, will set and inefficiently low price and thus reduce future quantity. However, oligopoly / monopolists will set an inefficiently high price, and too little will be consumed. To me, Big Pharma is clearly an oligopoly at best, with monopolies for individual vaccines etc. In this case, using Monopsony power to lower prices (like you pejoratively accuse the Clinton Foundation of doing) could result in greater consumption of vaccines, even in the long run. Pingback: Should we pay less for vaccines?